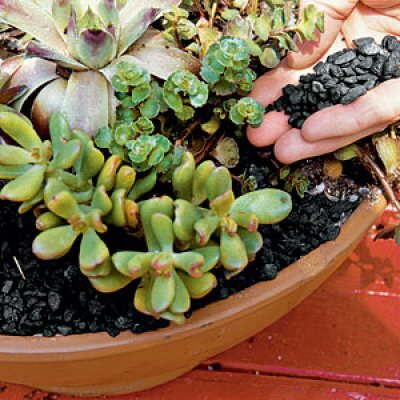 Easy to plant succulents survive both drought and heat. Some of the easiest plants to pot and take care of - they are known for taking care of themselves! Start with a wide and shallow container. 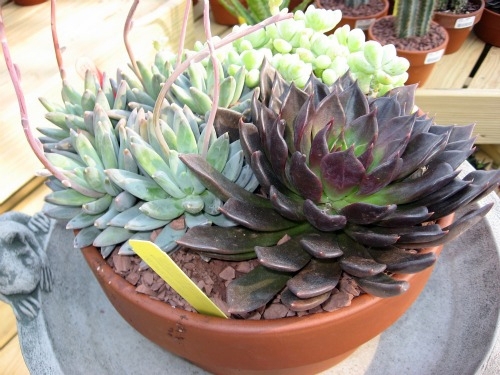 Since most succulents have very short root systems they don't need the space that other plants do. However, if you like the look of a large deep planter that is fine. Just know that the succulents will only take up the top few inches. Fill the planter approximately 3/4 full with good potting soil. Do not use garden dirt. 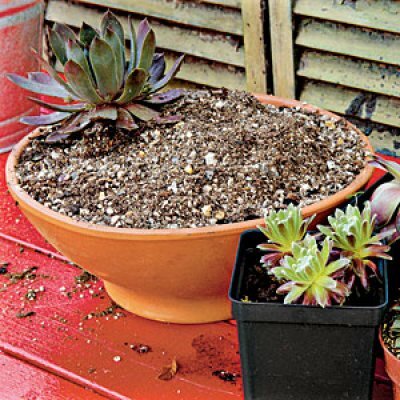 Remove the plants from their nursery containers, and plant the largest succulent on one side of the pot. Surround it with the other plants, clustering similar shapes together. To finish the look off and make it complete, sprinkle dark colored gravel around each plant making sure the soil is covered. Aloe Vera, Echeveria Silver Onion and Sedum Makioo Limelight.